“TGIF”! When you love to fish the back country or fishing the flats around Sanibel Island or Ft. Myers Florida that acronym takes on a lot of different versions. Thank God I’m Fishing, Thank God I’m in Florida, or in the life of Snook fishing, Thank God It’s Feeding”! Today the Snook bite finally turned on! We’ve had a lot of very unusual weather and the Snook population has had a terrible case of the shivers (water temp has been below 70 degrees) but today marked the first great day of Snook fishing for Team FlatsFish’r. Long time customer, Dan McConlogue brought his good buddy Dan Buckley, both from the Forest Country Club for a great day of fishing/catching. The day started with making sure that “Mama Rose” packed a generous supply of her famous sandwiches for the guys. With the cooler securely stored we set out for our journey. 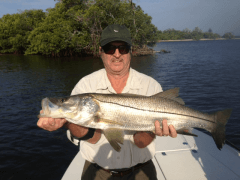 Our first stop proved to be a great one with both Dan’s hooking and landing multiple Snook. It was great seeing the Snook enjoying the “snicker bars” tossed out and having multiple busts on the baits soon after landing in the water. Next we headed up to big Jack country. With some hunting and chumming, we finally got Mr. Jack going. After a while Mr. Jack got both guys to cry uncle and waive the white surrender flags. What a great day with a couple of great guys and feeding the Captain with some famous Mama Rose’s sandwiches will always get you to the best and most secret spots! Get out on the water, take a kid fishing and always remember that “it’s great being us”! Captain Blake Matherly is a full time Spin and Fly Fishing guide. Captain Blake holds a United States Coast Guard 50 Ton Master Captain's License. 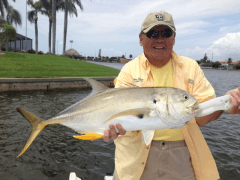 Your Captain is fully insured and supplies a Florida Fishing License for all clients. He is a member of numerous Pro Guide programs including, Simms, Sage, Temple Fork, DOA Fishing Lures, Hatch Fly Reels, Power Pole, Penn, Calusa Cast Nets, Patagonia, and Columbia.